Objective: To assess the effect of the introduction of a physiotherapist with an extended scope of practice in the management of acute soft tissue knee injuries in an accident and emergency (A&E) department. Methods: The A&E department established an Acute Knee Screening Service (AKSS) in 1998. An experienced physiotherapist was appointed to run the AKSS after additional training. Local guidelines and protocols were developed in conjunction with trauma knee surgeons, radiologists, physiotherapists, and A&E doctors. This study describes 100 consecutive patients managed by the AKSS over a three month period and comparisons are made over a similar period before the introduction of the AKSS. Results: The initial diagnosis of patients with acute knee injuries referred to the service showed meniscal injuries (38%), cruciate ligament injuries (18%), fractures (2%), patellofemoral joint injuries (10%), and others (32%). Ninety five per cent of patients referred to AKSS were seen within one week. Medical time was saved in both A&E and trauma clinic. Fifty nine per cent of patients were treated and discharged from the service without further medical review. Thirty nine per cent (39) were referred to trauma clinic and of these 44% (17) had MRI scans performed as requested by the physiotherapist. Eighty eight per cent (15) of these scans showed significant abnormality: (nine, anterior cruciate ligament tears, one, posterior cruciate ligament tears, and nine meniscal tears). Conclusions: A physiotherapy practitioner working with an extended role is a valuable addition to an A&E department. The AKSS improves the quality of care of acute knee injuries, saves medical time, and fosters cooperation across services within the NHS. Acute knee injuries presenting to accident and emergency (A&E) departments are common. The knee is the most commonly injured joint in the high risk sports of soccer and rugby.1 Acute knee injury is the commonest cause of permanent disability after a sports injury.2 The initial management of these injuries has historically been by assessment in A&E by non-orthopaedically trained junior medical staff and either treated by discharge to home, review and discharge to the general practitioner with physiotherapy, or referral to the orthopaedic knee clinic. The secondary referral to the knee clinic required assessment and review by orthopaedic surgeons with a high proportion of patients being discharged without any further action being needed. The last system is cumbersome and protracted requiring multiple clinic attendances and is at best inefficient. It is impractical and inefficient for a knee surgeon to review all knee injuries when only a small proportion requires specialist intervention. The requirement is for a screening process to channel patients into the correct management stream. Over recent years, there have been attempts to streamline the acute knee injury management,5,7–9 and the number of physiotherapists working in extended roles has expanded considerably.10 The Acute Knee Screening Service (AKSS) however, differs from these other extended roles in that the physiotherapy practitioner is involved in the initial diagnosis, investigation, and management of these patients in an emergency setting rather than “routine” outpatient work. These developments have led to quicker access for patients to practitioners with specialist skills, save medical time,8 and reduce orthopaedic waiting lists.11 Studies also have suggested comparable7 or higher levels4 of patient satisfaction with assessment and treatment from physiotherapy practitioners. This study describes the effect of introduction of a dedicated A&E physiotherapy practitioner in the management of acute soft tissue knee injuries. This person works closely with the A&E department and the trauma knee surgeon. We believe this is one of the first of such approaches to be developed in the UK. The A&E department established an AKSS in 1998. A senior chartered and experienced physiotherapist was appointed to run the AKSS. He received additional training from consultant radiologists in early 1998, in relation to radiation protection and analysis of plain radiographs and magnetic resonance imaging (MRI) scans. Attendance at trauma clinics, specialist knee clinics, and specific teaching clinics with trauma knee surgeons was also undertaken to establish standard methods of examination and data recording. To ensure appropriate use of this service and use of investigative services by the AKSS, we developed local guidelines and protocols including inclusion and exclusion criteria, for the management of acute knee injuries. This development occurred in conjunction with A&E consultants, trauma knee surgeons, radiologists, and physiotherapists. All patients with a diagnosis of an isolated knee injury were seen initially by the triage nurse on attendance and underwent radiological investigation according to Ottawa Knee rules.12 A SHO assessed the injury and any bony injuries referred to the orthopaedic team. We referred all other knee injuries either directly during working hours or on the next working day to the AKSS, according to guidelines (appendix, see journal web site). The A&E physiotherapy practitioner performs clinical examination, requests appropriate investigations (plain radiography and MRI scan), makes a provisional diagnosis, and instigates appropriate patient management and treatment interventions. The AKSS only accepts new referrals from medical staff within the A&E department. Discharged patients are able to return to AKSS within eight weeks of their final visit but were not reviewed after this time. Patients may be fast tracked to a dedicated consultant led trauma knee clinic as necessary. To assess the AKSS, we identified 104 consecutive patients referred to the service over a three month period April to June 1999 and compared with a similar period in 1998. We reviewed the A&E notes, AKSS records, any radiological findings, and the trauma clinic notes. Altogether 100 patients with a complete set of records were subjected to analysis including the appropriateness of investigations and referral to trauma clinic. Four patients were excluded from the study because of incomplete data. We noted the initial diagnosis, management, and outcome and compared the results with a similar cohort of patients seen in the A&E department one year before the introduction of the practitioner. The acute knee service has been well received by patients, radiologists, trauma knee surgeons, A&E staff, and physiotherapists. There were 62 men and 38 women with an age range of 11–72 years (mean 33.7). The predominant mechanism of injury was indirect trauma (66%) and most patients attended A&E once (95%). One patient referred to the AKSS fell outside referral criteria because of age (11). The AKSS managed patients with an initial diagnosis of meniscal injury (38%), cruciate ligament injury (18%), fracture (2%), patellofemoral joint injury (10%), and others (32%) (for example, bruise, simple sprains, bursitis). The commonest reason for referral to AKSS is history of swelling, locking, or giving way (table 1 ). Seventy six per cent of AKSS patients had radiological investigation on their first attendance at A&E. A further 10% (10) (comprising 7% (7) radiographs only and 3% (3) radiographs as well as MRI scans) had radiography in AKSS and 1% in trauma clinic. The 10 additional radiographs requested by AKSS showed a fractured patella in one patient, another had loose body, while eight were reported as no bony injuries. Of this last group, two showed no significant abnormality, one had posterior cruciate ligament injury, and two underwent arthroscopy. 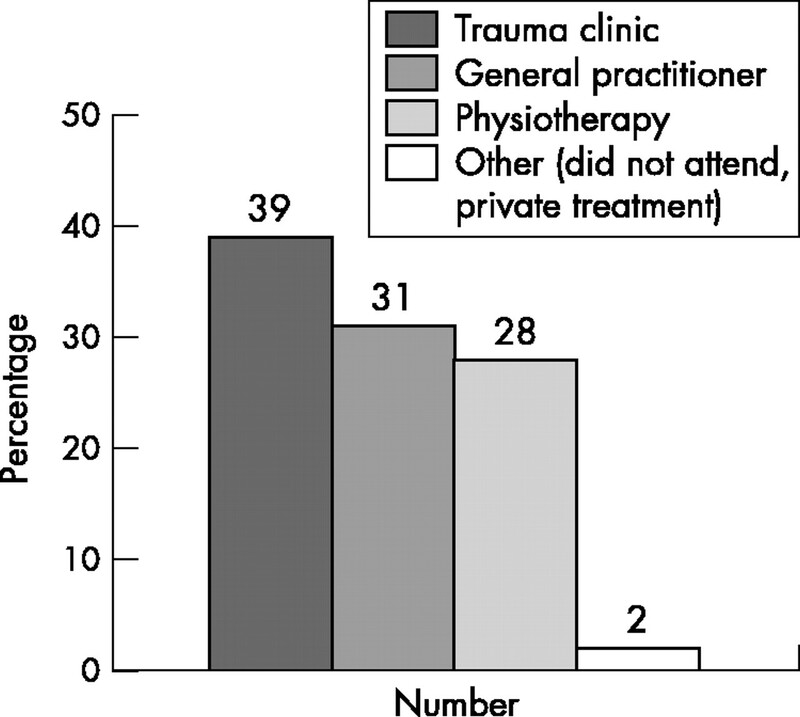 Thirty nine per cent of AKSS patients (104) were referred to trauma clinic (table 2 ). Of these, 49% (19) had MRI scans requested by the physiotherapist. However, only 17 (44%) actually had the scan as one patient did not attend and another patient went privately (fig 1 ). Eighty eight per cent (15) of these scans showed significant abnormality: nine anterior cruciate ligament, one posterior cruciate ligament, and the rest menisci injuries. In the trauma clinic they were further assessed with arthroscopy and reconstructive surgery where appropriate. Ninety five per cent of patients referred to the AKSS were seen within one week. Fifty nine per cent of patients were treated and discharged from the service without further medical review. Review of AKSS to screen and investigate soft tissue injuries of the knee using established protocols has confirmed the value and safety of such an arrangement. There is always concern when actions, which have historically been the preserve of the medical profession, are delegated to others. The evidence as shown above indicates however that when people are trained to perform a specific role in a well organised set of protocols there is both an increase in diagnostic efficiency and a reduction in management and clinic time. The fact that 59% of patients referred to AKSS were seen and discharged home without further referral, meant that review attendances to A&E and initial attendances to trauma clinics were reduced. Medical time was saved in both A&E and the trauma clinic. Furthermore, compared with a similar period in 1998 (table 2 ), referrals from A&E for admission or immediate orthopaedic opinion and referral to trauma clinic decreased significantly, alongside increased referral to AKSS. As 39% of patients sent to AKSS were subsequently referred to trauma clinic, often after clinical assessment and investigation, these patients were previously potentially discharged from A&E without any further specialist attention. This has clinical and cost implications in terms of morbidity, loss of productivity, and absence from sporting activity. Also, radiological investigations (radiographs and MRI scans) carried out by AKSS revealed significant abnormality. Thus this service enabled early diagnosis and management of acute knee injuries as well as having the potential to capture cases that may have been inadvertently sent home from A&E department without any follow up. Published work has also shown that the mean delay from injury to diagnosis of anterior cruciate rupture was 22 months.14 An analysis of a subgroup of patients who were referred to trauma clinic revealed that management of these patients was not delayed as they were seen in trauma clinics more appropriately and with appropriate investigations already arranged. New SHOs in A&E have been shown to miss significant injuries of the knee.15 The training of our physiotherapist with an extended role in knee injuries involved a three year undergraduate general physiotherapy training, a five year post graduate training, and experience including three years in emergency medicine. In addition, the A&E physiotherapy practitioner underwent further training in radiation protection, analysis of plain radiographs and MRI scans and specific training organised by the trauma knee surgeon. On the other hand, an average SHO in A&E has had extremely limited training in joint and knee assessment. The physiotherapist radiographed and diagnosed a fractured patella that had been missed by the referring doctor. Otherwise fractures are treated by A&E staff before referral to trauma clinic. The provision of AKSS has therefore improved the quality of care of acute knee injuries in the A&E department. It also helped build interdisciplinary relationships between A&E doctors, trauma knee surgeons, radiologists, and physiotherapists. No detailed cost benefit analysis of AKSS has yet been undertaken compared with traditional pathways of care but to employ an experienced physiotherapist with an extended role in A&E costs approximately £25 000. This study highlights the advantage of trained physiotherapists extending the parameters of their traditional role to encompass some of the tasks previously undertaken by junior doctors. A physiotherapy practitioner working with an extended role is a valuable addition to an A&E department and performs at least as well as the average A&E doctor in the management of soft tissue knee injuries. There is a suggestion that the perceived quality of care is likely to be improved by the utilisation of a specifically trained physiotherapist working within the acute knee screening service. Nevertheless, a prospective randomised controlled trial is needed to compare interventions from acute knee screening service with those of conventional methods of care, in order to evaluate fully clinical and cost effectiveness. We would like to thank Alun Morgan and Adrian Broad (Physiotherapy Services Managers) and Dr David Lloyd consultant radiologist for their help and support in the development and continuance of the service. OOJ designed the study protocol, participated in data collection, analysis and interpretation of data and writing of the paper. GP participated in design of study, collection of data and writing of paper. SM participated in the execution of the study particularly data collection. PR initiated the study, supervised the study, participated in the design of the study, data collection, analysis, interpretation of results and writing of paper. JF initiated the study, participated in the interpretation of results and writing of paper. PR is the guarantor of the paper. Bollen S. Injuries of the sporting knee. Br J Sports Med2000;34:227–8. Kujala UM, Taimela S, Antti-poika I, et al. Acute injuries in soccer, ice hockey, volleyball, basket ball, judo and karate: an analysis of national registry data. BMJ1995;311:1465–73. Dowling S, Barrett S, West R. With nurse practitioners, who needs house officers? BMJ1995;311:309–13. Daker-White G, Carr AJ, Harvey I, et al. A randomised controlled trial. Shifting boundaries of doctors and physiotherapists in orthopaedic outpatient departments. J Epidemiol Community Health1999;53:643–50. Hattam P, Smeatham A. Evaluation of an orthopaedic screening service in primary care. British Journal of Clinical Governance1999;4:45–9. Weaver J. Workforce planning. Workforce proposals take a radical line. BMA News Review 2000;May:26. Byles SE, Ling RSM. Orthopaedic outpatients—a fresh approach. Physiotherapy1989;75:435–7. Hourigan PG, Weatherley CR. Initial assessment and follow-up by a physiotherapist of patients with back pain referred to a spinal clinic. J R Soc Med1994;87:213–14. Weale AE, Bannister GC. Who should see orthopaedic out-patients—physiotherapists or surgeons? Ann R Coll Surg Engl1995;77:71–3. Ducksworth N. Extended PAM roles revealed. Physiotherapy Frontline2000;6:8. Durrel S. Expanding the scope of physiotherapy: clinical physiotherapy specialists in consultant's clinics. Manual Therapy1999;1:210–13. Stiell IG, Greenberg GH, Wells GA, et al. Prospective validation of a decision rule for the use of radiography in acute knee injuries. JAMA1996;275:611–15. Darwent M, Gamon A, McLoughlin F. Early physiotherapy within the accident and emergency department. Physiotherapy1998;83:281. Bollen SR, Scott, BW. Anterior cruciate ligament rupture: a quiet epidemic? Injury Int J Injured1996;27:407–9. Mitchell PD. The assessment of acute knee injuries by senior house officers in the accident and emergency department. Injury Int J Injured1998;30:215–18.